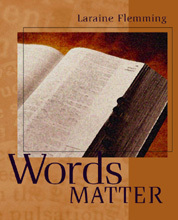 Like its sister text, Words Count, Words Matter takes a contextual approach to teaching word meaning. Each chapter introduces ten words linked by a common theme like humor, light, heat, or friendship. This thematic approach makes it easy for students to compare and contrast words related in meaning or structure. It thus gives them several ways to mentally link and learn the 240 words introduced in the text. In particular, it gives them multiple ways to anchor both words and meanings in long-term memory. Like Words Count, Words Matter also offers a specific strategy for learning and remembering each new word. Pre- and Post-Tests: Tests at the beginning and end of a chapter help students chart their progress. Advanced Mastery Tests: In addition to the post-test, each chapter ends with another, more advanced test that indicates how well students can recall, and not just recognize, correct word meanings. Abundant Practice: Every chapter offers six different types of exercises ranging from multiple choice to true or false and sentence completion. Carefully Controlled Sequence of Exercises: The exercises are sequenced so that students move from cognitively simple exercises like multiple choice and matching to exercises that require more critical thinking and more recall of word meaning.